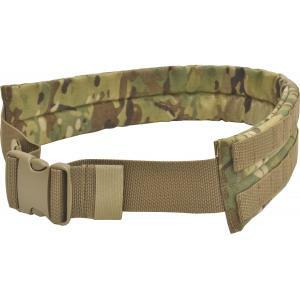 Padded belt with MOLLE Webbing. Multicam  - $46.03 : Advantage Supplies, Inc.
Our Padded MOLLE belt works great alone or paired with one of our Tactical Vests. The pad measures 3" wide and has 2 rows of MOLLE webbing to attach any of our smaller utility pouches, mag pouches or canteen/utility pouch. Available in two sizes, Medium and Large, with several inches of adjustment to fit over a jacket or parka or any other cold weather clothing. This belt features a large plastic buckle that can be opened quickly with one hand. Roll up and tuck loose webbing into elastic loops. Medium: the padded belt portion measures approx. 31.5" with 16 more inches of adjustable webbing, the shortest adjustment is approximately 35.5" and the longest adjustment is approximatley 49" long. Large: the padded belt portion measures approx. 33.5" with 20 more inches of adjustable webbing, the shortest adjustment is approximately 39" and the longest adjustment is approximatley 56.5" long.